A continuing delay by China’s Exim Bank to extend a loan of US$ 1.1 billion (Rs 158 billion) to Sri Lanka has put on hold the first phase of the Central Expressway project. 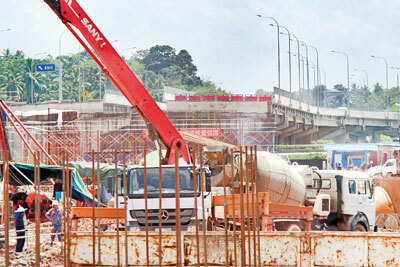 The project covers 37.09 kilometres and links up to the rest of the Central Expressway from Mirigama. “If we don’t receive the loan by February or March next year, we will have to look for other options,” Road Development Authority (RDA) Chairman Nihal Suriyaarachchi told the Sunday Times. He said the first phase of the project was to begin in June last year and completed in 2020. The chairman said that if the loan was received, the Government would have to reach an agreement that the cost of the project would not be increased by trying to expedite the construction work. Highways Minister Lakshman Kiriella confirmed that the loan was long overdue, thereby delaying the project. “We have taken up the matter with the Chinese Ambassador in Colombo and hope to expedite the loan through diplomatic channels,” Mr Kiriella told the Sunday Times. He said the completion of the first phase was important to make maximum use of the project as the expressway had to link up with the next phase of the Mirigama-Kurunegala stretch. An official of the External Resources Department (ERD), which is under the Prime Minster’s purview, said the issue of the loan was taken up during the visit of the Prime Minister to China and the Government hoped to take up the matter with the Chinese embassy in Colombo again. He said the Government was keen on obtaining the loan as it had a fixed interest rate and was repayable in 20 years with a five year grace period. The official said that negotiating of another loan could delay the entire process and the project itself.